An annual bush to 60cm, grown from seed, germinating in 2-7 days. 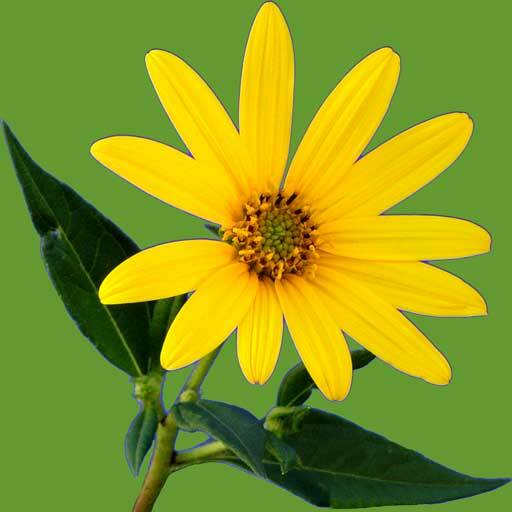 Plant in spring/ summer, to early autumn, in full sun, in well limed soil. The soft leaves are three-lobed, triangular in appearance, which is indicated by the generic name ‘trigonella’, which in Greek means three-angled. Fenugreek is one of the oldest recorded medicinal herbs, highly esteemed by both east and west, and has been regarded as a cure for just about every ailment known to man. Fenugreek has a most beneficial action on cleansing the blood. As a diaphoretic it is able to bring on a sweat, and help detox the body. This can take place through the pores of the skin. The pungent aroma of fenugreek may be smelt on the skin and under-arm perspiration. This is evidence that the herb is working well! Shower frequently. The body odour of fenugreek, is no where near as offensive as a body reeking of garlic. Fenugreek also has the reputation as a lymphatic cleansing herb. The lymphatic system is the vacuum cleaner of the body. It has the vital role to irrigate the cells with nutrients and to remove toxic wastes, dead cells and trapped proteins. The fluid is cleaned through the lymph nodes, before the body’s 13 litres of filtered lymph fluid recycles again via the subclavian vein near the heart. A blocked lymphatic system can mean poor circulation, fluid retention, pain, loss of energy, and disease anywhere in the body. An efficient working lymphatic system is essential for a strong immune system. Steve Meyerowitz in ‘Sprouts the miracle food’ mentions that the chemical composition of fenugreek resembles that of cod liver oil, and is considered a sister herb to garlic, and fenugreek is found to actually enhance the disinfectant properties of garlic. Fenugreek is a valued herb for all mucus conditions of the body, particularly the lungs, by helping to clear congestion. Use for head colds, influenza, catarrh, bronchial complaints, asthma, emphysema, pneumonia, pleurisy, tuberculosis, sore throat, laryngitis, hay fever and sinusitis. Fenugreek has featured for peptic ulcers and inflamed conditions of the stomach and bowel, and with its healing and soothing action creates a protective coating like a lubricant over inflamed areas. To Sprout Fenugreek soak 3 tablesp. of seeds in a glass jar (I use straight sided vacola preserving jars) with 2 cups of water 8-12 hours. Place a piece of net curtain, gauze or old stocking over the top of the jar and secure around the neck with a firm rubber band. Drain off the water and reserve to drink. Turn the jar upside down and on an angle to drain on the kitchen sink drainer. 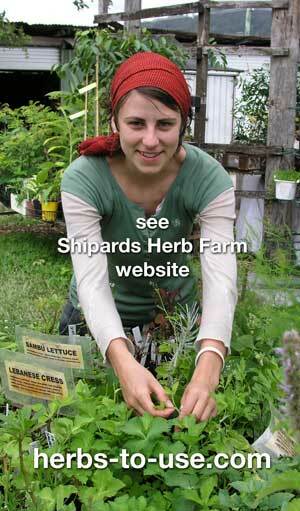 Rinse seed in jar twice daily to keep the seed moist (one rinse a day is usually adequate in winter). The water used to rinse can be reserved to drink also. Roll the jar in hands (so the seed is loosened and does not stick together in a mucilaginous mass) and turn up side down on an angle on the drainer, each time after rinsing. Sprouts are ready to eat in 2-4 days (this will depend on the season and temperatures). When the sprouts are the length you wish to eat them (best 1-3cm long), they can be eaten in hand as a snack, added to sandwiches, tossed salads, mixed with potato salad and other root vegetables, added to stir-fries just before serving, and used as a garnish. Try fenugreek with slices of fresh paw-paw or mango, in fact any sweet dish. I am partial to a slice of bread or toast topped with honey or ginger jam, cream and fenugreek sprouts. Try bread topped with lemon butter, cream and sprouts. Seed, when sprouted to the desired length, should be stored in the refrigerator with a covering over (or the seed will dry out and not be as tasty). Sprouts are valued for stimulating and fortifying the body. 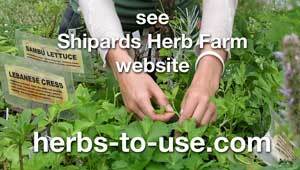 Grow fenugreek in large pots, or in the garden. When the seed pods turn yellow, it is time to pick for seed saving, otherwise the pods will split open and the seed will drop. Use young leaves in salads, sandwiches, as a steamed leaf vegetable and added to soups and stews. Leaves of young plants are very tasty, resembling the flavour of fresh peas. Most health food shops stock fenugreek seed for sprouting. Seed is usually viable for 2 years. Viability is important for success with sprouting. 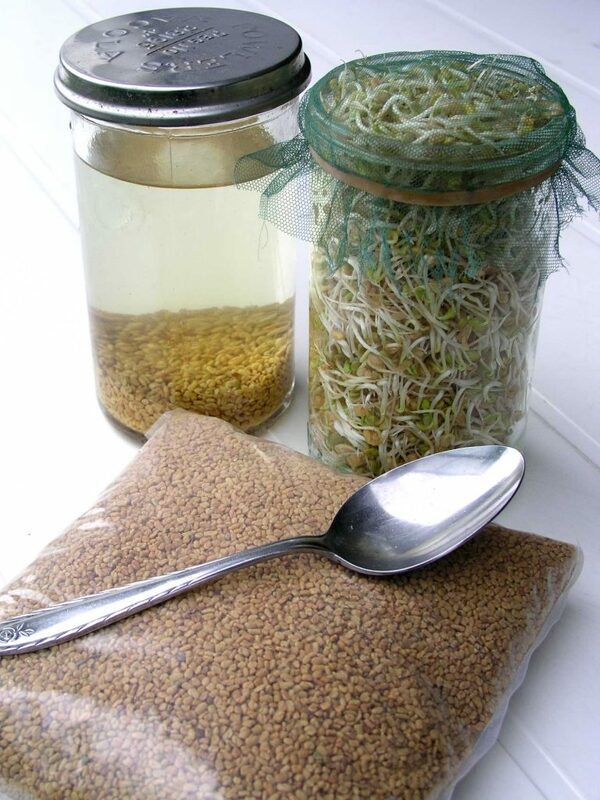 In winter if you have trouble getting the seeds (for sprouts) to germinate evenly, try soaking the seed in warm to hot water to start the germination. Eating sprouts regularly is valuable for health and vitality. Sprouted seeds are a high source of essential vitamins, particularly A, B, C and E, amino acids and living enzymes. The beneficial enzymes amylase (essential for digestion of carbohydrates), protease (for protein digestion), lipase (for fat digestion), coagulase (assists blood clotting), emulsin and invertase (for sugar conversion), makes fenugreek sprouts something we can all benefit from regularly. Let fenugreek become routine in your daily life.